Almo Nature - Dog - Daily Menu Bio Paté is a paté for dogs that contains pure and organic ingredients. This way, you are not just giving your dog healthy food, but you are also contributing to respect for the environment. Almo Nature products are developed with a focus on animals and their wellbeing, seen from their perspective. That is why the products in this brand are 100% free from animal testing. 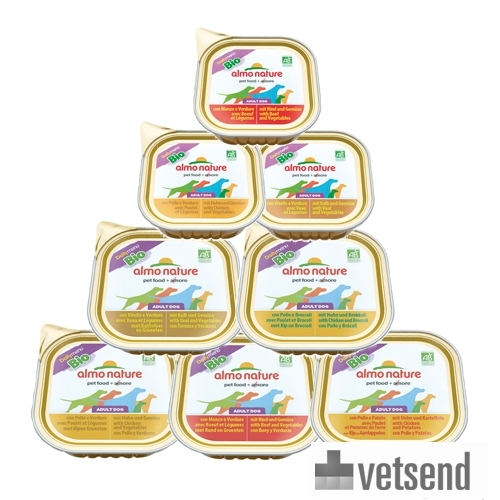 Daily Menu Bio Paté was developed by Almo Nature for adult dogs. It is 100% organic, with ingredients coming from certified farming companies. Almo Nature Daily Menu Bio Paté contains no preservatives, flavour enhancers or colouring agents, and the meat used has no added chemical residues or pesticides. This makes it very nourishing and contributes towards a better environment. Dry food are the base food for most dogs. By combining this with Almo Nature - Daily Menu Bio Paté, you stimulate the dog's sense of smell. It ensures that the dog gets an even tastier meal and receives all of the nutrients it needs from its diet for an optimal nutritional balance. Daily Menu Bio Paté is available in various flavours and comes in convenient portion packs of 9 x 300 grams. Beef and vegetable variety: Meat and animal derivatives (minimum 5% beef), vegetables, minerals, vitamin E.
Veal and vegetable variety: Meat and animal derivatives (minimum 5% veal), vegetables, minerals, vitamin E.
Chicken and vegetable variety: Meat and animal derivatives (minimum 5% chicken), vegetables, minerals, vitamin E.
Chicken and broccoli variety: Meat and animal derivatives (minimum 5% chicken), vegetables (minimum 5% broccoli), minerals, vitamin E.
Chicken & potato variety: Meat and animal derivatives (minimum 5% chicken), vegetables (minimum 5% potatoes), minerals, vitamin E.
Have you used Almo Nature - Dog - Daily Menu Bio Paté before? Let us know what you think about this product.